I can distinctly remember the summer of 2003. I was only a year into working in IT and realizing that I could seriously pursue this as a career. I was working two jobs, imaging Macs and performing various summer related tasks for my school district’s IT department during the day and serving up corn dogs, pizza and fried cheese on a stick (yes, really) at local fairs in the evenings and on weekends. I had just purchased my first iPod, the iTunes Music Store had recently launched and I was pouring a steady stream of my earnings into it. I spent over $500 that summer building the foundation of my music library and discovering new artists. It was exhilarating to have the vast landscape of music available to download on my iBook G4 using my Treo 650’s Edge connection with the tethering that I wasn’t supposed to be able to access. That summer opened me up to a world that my protected upbringing had previously been able to easily divert by driving past the record store and turning K-Love up on the radio. Over the next eight years I’d spend hundreds of hours building my iTunes library to the nearly/merely 13,000 songs that have made the trek with me through a slew of computers and migrations. Then it all changed. When I first heard about Spotify in 2011 I thought “That makes total sense.” after my brain processed the idea of having millions of songs instantly accessible in my pocket at one monthly cost. I’d been running Subsonic to have always-on access to my music library on my iPhone but it was fiddly and required me to maintain it which, as any nerd knows, takes way more time than you think. The convenience was as important as the music library to me at that point. Fast forward to today and I’ve become a Spotify addict. It’s one of the few apps I use daily and it’s lead me to discover some really terrific artists just like the iTMS had done for me as a teenager. With that said, I’ve switched to Apple Music for a multitude of reasons and with some changes to my music workflow. Here’s my impressions after a week with the service. For the majority of my time using an iPhone I’ve had a home screen that primarily consists of apps Apple didn’t create. 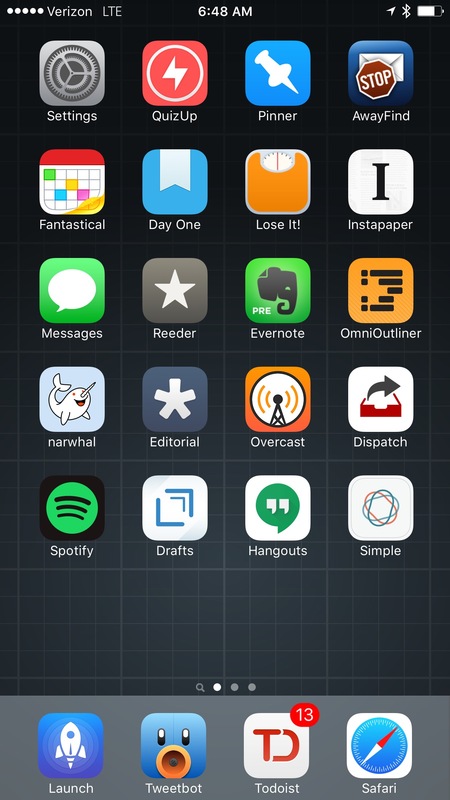 Until 3 weeks ago the only Apple apps on my home screen were Messages, Safari and Settings as seen above. I’ve been a Google Voice user since the service launched in 2009 and have gone through many iterations of how I use it on iOS including jailbreaking my phone to integrate it with the native Phone and Messages applications. Currently I use Hangouts to manage the handful of phone calls that I make and to text with my friends and family that don’t use iMessage. Since moving to Chicago and starting to work with a new team I’ve had more hurdles than ever before explaining how to get ahold of me between my carrier issued (or burner as it’s lovingly referred to by my coworkers) phone number and my Google Voice Number. Google hasn’t helped the situation as they continue to phase Google Voice out and roll these features into Hangouts which has a lackluster interface that’s shoved into GMail almost as an afterthought on the desktop. Google Voice continues to be cumbersome to use on mobile if you’re not on Android where it’s services are integrated into the OS and might not keep me around much longer. While Spotify isn’t nearly as fragmented as Google Voice has become, the announcement of Apple Music prompted me to dust off iTunes on my iMac and I realized how much of my personal music library isn’t a part of Spotify’s catalog and how much of it I miss having in my music rotation. While Spotify’s desktop application allows you to intermingle your local music files with the the Spotify offering, the mobile applications don’t. This leads me to use the native Music application on my iOS device to access a range of music from The Paper Raincoat to Girl Talk to Taylor Swift (yes, really) who famously pulled her music from Spotify last year. With Apple Music all of this music is intertwined with the streaming component of the service and provide a fully rounded music library. This is the dream come true for me. Outside of the one library to rule them all, Apple Music fulfills two nuanced features that are hugely important to me. The first is true background sync. I have a two hour commute via The “L” most days of the week and am underground for about half of the trip. For commuters like me offline sync isn’t a nicety, it’s a requirement. While Spotify has background syncing, it isn’t able to truly run in the background. If the application isn’t actively playing music or open and left open then syncing stops. When you have playlists that are 1,000s of songs deep, the time involved in getting the whole playlist synced for offline playback requires you to babysit Spotify for hours every time you restore your device. Being that I do this about twice a year, it’s become more of a nuisance to get Spotify ready for daily use. I’ve been using the native Music app for the last three weeks and started using Apple Music when it launched last Tuesday with no offline sync issues after one request to do so for a few large playlists. The second feature that I’m most interested in is the sound quality of Apple Music. While sheer numbers would indicate that Spotify still offers a higher quality file, I will refer you to Kirk McElhearn’s post regarding the quality of Apple Music’s tracks that pre-emptively refutes that claim. I believe he’s correct in the expectation that Apple Music provides higher quality files through the AAC/MP4 codec. So far in my usage of the service I’m glad to have found that iTunes is downloading M4P files to a new folder within the iTunes folder structure. These files are nested in a new Apple Music subfolder in the same way that the music I have accumulated over the years is nested within the Music subfolder of my iTunes directory on my Mac. I much prefer this method of offline music storage to Spotify’s obscuring of the file names and folder structure within a buried Library folder. It can be easily managed and the fact that I’m getting copies of the songs just as though I’d bought them from the iTMS (albeit with DRM wrapped tightly around the Apple Music files) instills a sense that I’m getting what I paid for in a way that Spotify’s offline syncing just doesn’t. The perceived value of Apple Music is definitely greater for a nerd like me. Consider how during what was arguably the most important day in Apple’s music history, nearly the entire discussion was centered around Beats 1. The 30 million songs now available for streaming are nice, but we are already used to that with other streaming sites. Lots of curated music playlists are helpful, but something seems to be missing. Apple’s intention on launch day was clear. The buzz surrounded Beats 1. What was Zane Lowe saying? Who was he playing? What are other people thinking? It’s been fascinating to watch people I know who are paid users of other services all start conversing about switching to Apple Music. Beats 1 has been a core driver in these possible conversions and proves that Apple’s investment in building great programming that’s driven by proven tastemakers and the artists themselves was a bet that will pay dividends. I listen to music on multiple devices and am a longstanding last.fm user. Spotify has made the process of remotely controlling your library and scrobbling tracks to Last FM natively from their applications easier over the last few years. These processes are different (in both good and bad ways) with Apple Music so I wanted to provide some context on those thinking about switching. Last FM is like a journal for music listening and is a required part of my music listening experience. I like having a running log of what I’ve listened to and knowing that I can look something I’ve listened to up with ease. I also like sharing what I listen to with the world because music is a communal experience. There is little in the world that feels as good as finding and sharing an artist that you fall in love with. I want to contribute to that ecosystem and Last FM automates that process. The method of capturing a track that you’re listening to and adding it to your listening history is known as scrobbling on Last FM. Where Spotify integrates scrobbling natively, iTunes and Music on iOS don’t. In order to scrobble your listening history to Last FM you’ll need a third party application on Windows, iOS and Mac OS X. Here are the applications I’m using. I first found out about Simplify from Brett Terpstra when he started creating jackets for Simplify and created the beautiful and simple Sidecar jacket which I use to this day. Amongst the many features that Simplify provides for music application management and information is scrobbling support for the foremost music application on your Mac. I primarily use Simplify for the information on the current track and scrobbling. Simplify is $4.99 and is available on the Mac App Store. One of the biggest limitations I expected on iOS with scrobbling is that the application needs to be running at the forefront for real time scrobbling of what’s playing in the Music app on iOS. This expectation stems from my time before Spotify when I would jailbreak in order to have the Music application or Subsonic scrobble in real time. While you no longer needs to jailbreak iOS to do this, it’s still not perfect. If you’re like me, you don’t want the possibility of any tracks being missed during this process. Initially I was going to recommend the combination of QuietScrob and CloudScrob to ensure this wouldn’t happen. Unfortunately I had an issue with duplicate, triplicate and quadruplicate scrobbles being uploaded for the same play of a song and skewing the data when using both applications so I had to pick one application and I went with the former. QuietScrob is beautifully designed and runs in the background using background app refresh to scrobble in as close to real time as you’re going to get on iOS right now. It’s the set it and forget it approach to scrobbling. I also think QuietScrob’s free to paid conversion method is clever and effective. The application is free to install but requires you to open the app and watch a video ad in order to unpause scrobbling after so many tracks have been scrobbled. You can remove the ads for a one-time $0.99 in-app purchase if you like the application. In the short time I’ve been using QuietScrob I’ve had a few instances where I’d listened to music and noticed that it hadn’t been scrobbled. This was typically after a device reboot but it still didn’t fit my expectation of 100% tracking of my listening history. QuietScrob doesn’t (at least for me) look at your listening history in order to fill in the gaps since the app was last running. If you’re looking to ensure nothing is missed and are willing to remember to open an application regularly then CloudScrob may be a good alternative for you (Just don’t use it in tandem with QuietScrob). CloudScrob is an incredibly simple app that looks at the timestamps on songs in iOS, compares them to what’s already been scrobbled on your Last FM account and scrobbles the tracks that aren’t already listed in your listening history. I’ve found it to be 100% accurate and the most dependable way to ensure nothing is missed. Unfortunately I don’t want to have to remember to open the application regularly to ensure my profile is up to date so I’m sticking with QuietScrob as my primary method to scrobble from iOS. CloudScrob is $0.99 on the App Store. When I’m cooking and doing other chores at home I like to have music broadcasting from our iMac and to other speakers through airplay (that setup is another post in itself). I need to be able to control my music while I’m busy without needing to stop off at the iMac to do so. Spotify Connect has enabled this type of control from my iPhone for awhile now and I’ve grown accustomed to having this feature. Luckily Apple has long offered remote control of iTunes using their Remote application so I’m not at a loss in making the switch. Apple is actually able to take things a step further with the Apple Watch to provide these controls on your wrist and it’s become my new standard for remote control of my music. I started writing this post before Apple Music launched and have continued writing it through my first week with the service. There are important features that come with Apple Music that I didn’t cover here as it wasn’t what I set out to write about but they’re clear advantages for the service. Siri integration is the most obvious and unexpectedely useful part of Apple Music, especially with the Apple Watch. It’s worked beautifully the handful of times I’ve used it and it never fails to delight me when it does. Unfortunately the additional features are a double edged sword that lead to a UI that’s working to include a decade of features on top of everything that’s new about the service. This leaves a hefty UI with what feels like a lot of application easter eggs that provide a steep learning curve for most iOS users. While Apple Music has plenty of hurdles in it’s UI and expanding feature bloat, it’s ability to finally provide a truly all-in-one music library is enough to make it my primary music service. The native integration with the OS, curated discovery and artist driven communal listening experience on Beats 1 are just the icing on the cake. I’m not a dunce. Yes, Girl Talk is on Spotify, but not all of his music is.